Liberals have fought to remove religion from the public square ever since the Supreme Court declared there must be a separation of church and state in 1948. So why would the State Department host a religious dinner? Especially for an ideology that seeks to turn America into Islamatopia. Apparently, it’s because the State Department has done so for almost twenty years. Sec. Madeline Albright started this appeasement tradition in 1999. That doesn’t make it a mandate. Yet that’s what Democrats would have you believe. Islam is the new politically correct, secular religion of the Left. For it furthers liberals’ goal of removing Judeo-Christian values from America’s public discourse and experience. And that’s precisely what Secretary of State Rex Tillerson is fighting against – the obliteration of America’s founding principles. The 2016 election proved that Americans are sick and tired of the Left’s PC BS. Thus, the Trump team is DONE catering to Muslims. America finally has a presidential administration that puts America first. 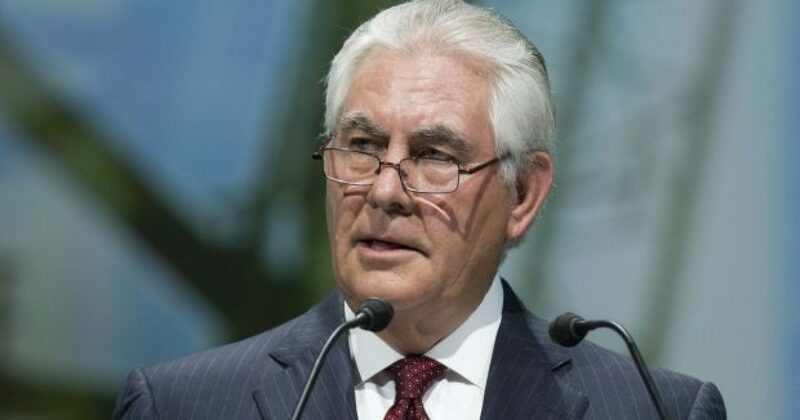 Rex Tillerson refuses to host Ramadan. Islam is not open-minded to America’s western values. So, why should we continue the liberal appeasement tradition of kowtowing to a religion that repeatedly attacks and murders Christians and Jews around the globe? Usually, this State Department Ramadan event boasts attendees from Congress, Muslim community leaders and diplomats, and senior U.S. officials. The Left sees it as part of their diplomatic outreach to Muslim countries and peoples. Meanwhile, we ordinary Americans scratch our heads in confusion at the mental disease known as the Democrat Party that seeks to appease those who declare us their enemies with each new act of terrorism. I don’t need to understand, or reach out to, or appease the so-called Muslim “moderates” who refuse to denounce the heinous behavior of radical Islamic extremism. Their “holy” book commands Muslims to wipe every other religion off the face of the planet. And that suits Americans liberals just fine. My countrymen have given too much blood and sacrificed too much freedom for Americans to surrender to that demonic ideology on our own turf. McCullom (1948) – Declared religious instruction in public schools unconstitutional. Engel v. Vitale (1962) – Declared prayer composition by public school districts unconstitutional. Abington School District v. Schempp (1963) – Declared Bible reading over school intercoms unconstitutional. Stone v. Graham – Declared posting of the Ten Commandments in public schools unconstitutional. Allegheny County v. ACLU – Declared Nativity scenes displayed inside government buildings unconstitutional. Lee v. Weisman – Declared prayer at public school graduations unconstitutional. According to every Supreme Court ruling, these State Department dinners mix mosques with state and are, therefore, unconstitutional. I’m glad Tillerson isn’t hosting one.